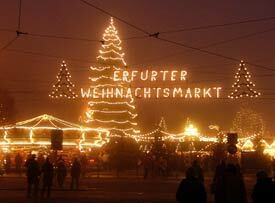 ABOVE: Erfurt's main Weihnachtsmarkt fills the spacious Domplatz in front of the Cathedral. Erfurt is a 1,250-year-old city in Thuringia, or Thüringen, in the "green heart of Germany." Its medieval city center is packed with historic buildings, including the Augustian Monastery where Martin Luther became a monk and the cathedral where Luther was ordained as a priest. The main Erfurter Weihnachtsmarkt is on the Domplatz, a large square in front of the 70 steps that lead up to St. Mary's Cathedral, the St. Severus Church, and the Petersburg Hill with its walled Baroque fortress. The fair, which runs from late November until just before Christmas, attracts busloads of visitors from throughout central Germany. You can also ride a Ferris wheel, ride bumper cars, and put your young children or grandkids on a minitrain while you sip from a mug of Glühwein. Smaller Christmas markets are scattered around town, most notably in the Anger square (in the heart of the department-store district) and by the Rathaus or city hall. Christmas-season hotel packages are available. These include guided city walks in German, but private guides who speak English can be hired through the tourist office.